I say this every year, but the Christmas/Holiday season is the best time to buy lipgloss. 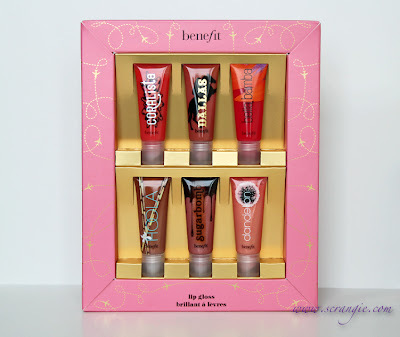 Among the many new holiday lipgloss kits being released this season is an awesome set by Benefit that features mini sizes of ALL of their brand new Ultra Plush lipglosses. The set is called High Flyin' Glosses and it contains 0.22oz mini tubes of all six new Ultra Plush gloss (which I've been meaning to post about for ages, oops) shades. The glosses are minis but they're the perfect size. 0.22 oz, which is just shy of half size. The scent is sweet and pleasant (it's the same on all shades and similar to the smell of the Benefit boxed powders) and there's a light sweet flavor as well. The glosses all look natural and flattering on my skintone and are likely to look equally natural on a wide range of skin colors due to the softness and sheerness of the colors. They're sheer but not invisible. Dallas is the most opaque, Dandelion is the most sheer, but all leave a hint of color, a lot of shine and a tiny, tiny hint of shimmer (if it's one of the shimmery shades). 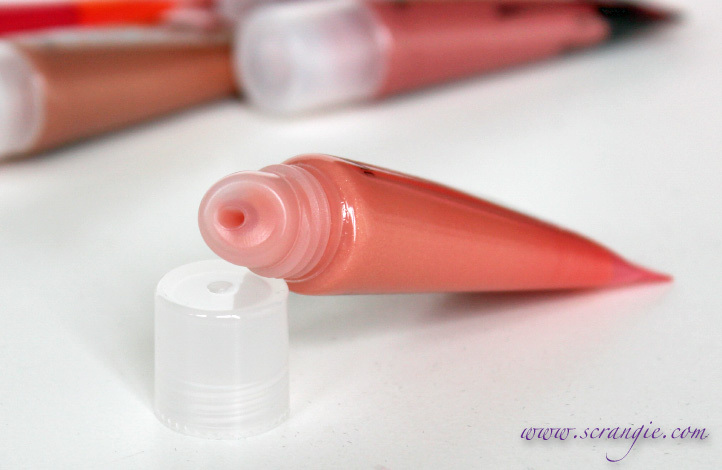 The cushy formula makes my lips look slightly fuller. The formula feels great. It has some slip to it and it feels cushiony-thick. It's not runny and it's not sticky. Feels like a balm after the shine wears off. It's not drying at all. Very comfortable. The glossiness wears off quickly but leaves behind a natural dewy look that lasts an average amount of time. This set is an excellent value at only $26. 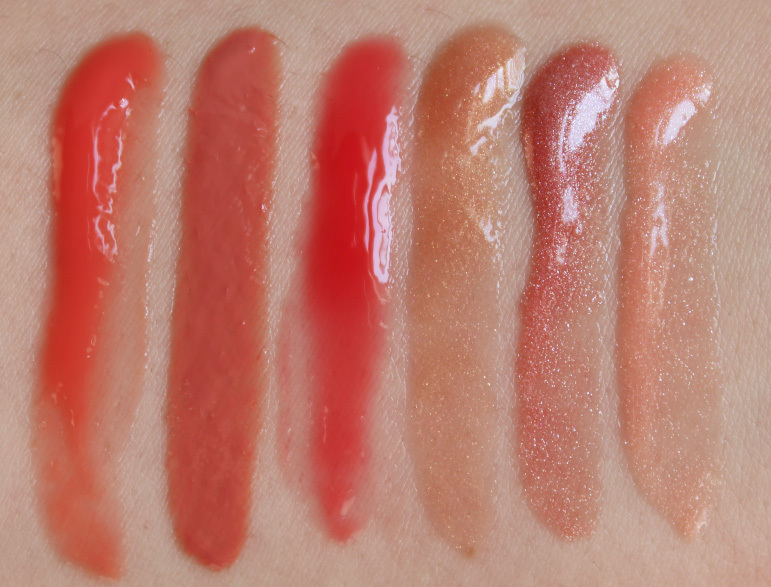 One full sized (0.5 oz) Ultra Plush Lipgloss is $16 on its own. 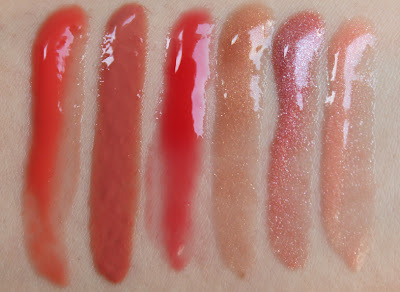 The gloss colors and the designs on the tubes all match with their namesake boxed powders/blushes. I love that. Nothing. I can't find any fault with this set. I can't even come up with something nitpicky to say about it. If you've been waiting to try the new Ultra Plush formula, this is the way to do it. Seriously. This set gives you half-sizes of all the colors for less than the price of two full sized tubes. Can't really beat that. 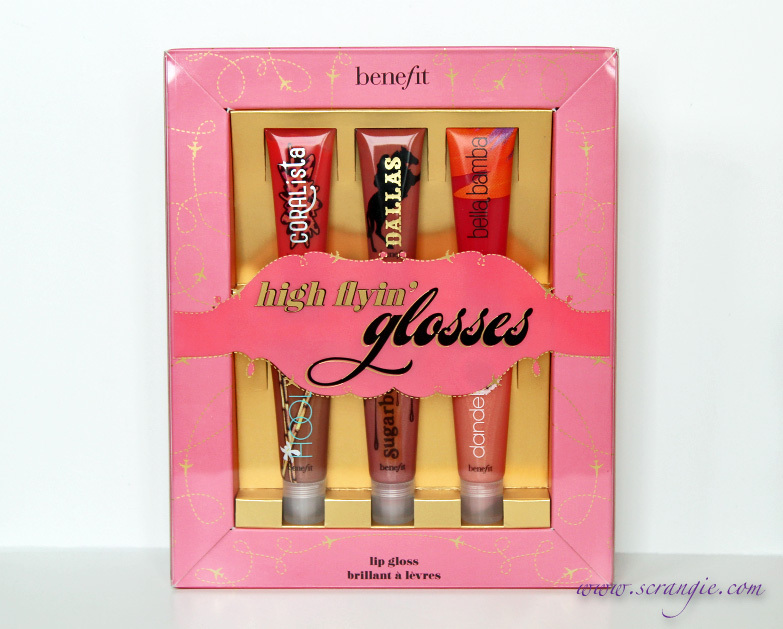 The Benefit High Flyin' Glosses set is limited edition and retails for $26. I've been crossing my fingers for a set like this! This seriously made my day. Love lipgloss sets! All of my Smashboxes lipglosses are from two different Christmas sets. I didn't know Benefit was releasing this, I am definitely going to pick it up! YES! I've got hoola in full size, ive been wanting to try the others...picking this up for sure! Okay I need this, Benefit - do them in the U.K! I've been wanting this, but didn't know if it was going to be any good. Now I'm gonna go and order it! Thank you!